My name is Susan Seubert, and I�m a editorial and commercial photographer based in Portland, Oregon, and Maui, Hawaii. As an assignment photographer for National Geographic Traveler for the last 10 years, I�ve learned that being prepared prior to leaving is the most important thing. The Internet has become my essential tool. I use a Google Image Search to help identify good locations for making iconic images. I also use it to find locales for an insider�s perspective. Locating a good paper map is also critical, particularly if you are heading to a place where satellite connectivity might be an issue. I also look at as many guidebooks as possible. In Portland, I�m lucky to have Powell�s Bookstore, where I can find just about anything in print I might need. Prior to any trip, you can find me in the travel section, picking out the best guidebooks and maps to bring with me. I love pocket-sized language books, because sometimes they are much faster and less frustrating than an app on a smartphone. Researching the language and customs of a place can yield very interesting photographic opportunities. When I was given an assignment in Beaujolais, France, my French was rusty, so I hired a private tutor to help me brush up. When I arrived in the small town of M�con, it took me no time to buy a SIM chip, get some Euros from the ATM, pick up a few snacks, and then hit the road to start scouting the locations that I was to cover � without wasting time because of a language barrier. Horses in a meadow, Beaujolais, France. Celebrations, religious ceremonies, festivals, and the like are all generally easy for photographers to access, and make a great addition to any travel experience. Being aware of upcoming specific events, prior to leaving, is essential for a solid travel story. When I traveled to Switzerland for National Geographic Traveler last September, I learned that there was a possibility the cows would be descending from the hills for their winter pasture. The farmers bring their cows straight through the villages and decorate the animals with flowers and ribbons for the occasion. Sometimes the towns through which the cows travel have an entire day�s worth of festivities to celebrate along with the local farmers. I spent hours online trying to find where and when I might be able to photograph this event. Through the process of researching, I met a number of people who turned out to be wonderful resources in the country. Because my trip was limited to certain dates, there was only one possibility to photograph the cow descent, in Gstaad, and I made it just in time. Decked-out cows on parade in Gstaad, Switzerland. Before I departed for my Beaujolais story, I had read about the F�tes des Conscrits that would be taking place in some of the villages in the area. I found one that was in a beautiful hilltop town, so I scouted it the day I arrived in France. This turned out to be a lifesaver, as the date listed online was incorrect, and had I not gone ahead of time, I would have missed this amazing experience. 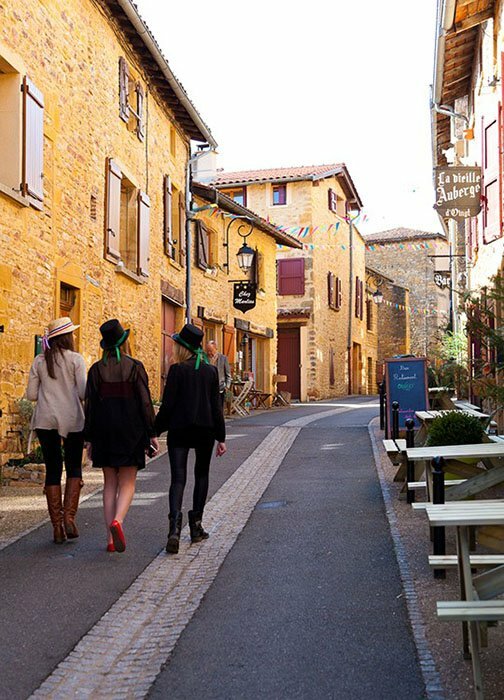 Strolling along a quiet street in M�con during the F�tes des Conscrits. Easy Release: This app not only allows me to get a signed model release that I can email to the subject, I can also add other info to the .pdf, and it helps me remember names and email addresses so that after the shoot, I can send photos back to the people who were kind enough to let me photograph them. Sun Seeker: This app is fabulous for scouting locations, as it has a 3D sun tracker that allows you to follow the path of the sun, based on your GPS coordinates. It also has a large database, so if you don�t have connectivity, it still works. Sunrise and Sunset: Find a simple app that contains all of the sunrise and sunset details based on your GPS location or a pre-determined list of cities. It also has civil twilight and the beginning of civil twilight, so that you know when the �blue hour� will be. Language Apps: I always try to study the language as best I can prior to leaving for a country where I don�t speak the language. There are several apps that can translate based on a voice, but those generally require an Internet connection. However, it�s nice to have some dictionaries available in your pocket to help you break through language barriers. The Google Images search will likely yield not only the great places to shoot, but also some ideas about what kind of lenses and other equipment needed for particular locations. I�m currently packing for a job where I�ll need some remote capabilities, so I�ve purchased a few new things and have been testing them prior to leaving. One of the set-in-stone rules of the road is to never, ever bring a camera or any other gear that you have not thoroughly tested prior to departure. The Sony RX100 III: This little gem has remote capabilities via Wi-Fi, a 1-inch sensor, a super-sharp Zeiss lens in an equivalent 24-70mm, and a viewfinder that is essential in bright light, despite the fact that the screen is pretty visible in bright light. I also purchased a CamRanger, which is a little bit trickier to operate. This allows me to control the camera remotely using a closed Wi-Fi connection and looking through the lens via my iPhone. Adding the CamRanger tripod head to pan and tilt remotely gives me even greater control. Flying in the US, it�s easy to determine what can and cannot go with you on the plane. International travel is much trickier. It is not a good idea to check your cameras. I suggest that you carry everything onboard the aircraft, even if it means wearing the equipment. I always have a photo vest in my carry-on in case of weight issues. I�ve found the best wheelie is the Think Tank International V2 rolling camera bag. It fits in the overhead bins of some of the smaller commuter jets and can accommodate my entire camera kit. For walking and hiking, I use the Think Tank waist belt with a holster that carries my Canon 5D Mark III with a 70-200mm f/2.8, plus I carry another camera with a 24-105mm on my shoulder. I have the Hubba Hubba Hiney pack where I store my wallet, biz cards, iPhone, small notebook, close-up lens and wide-angle lenses, pens, gum, ND/Polarizing filters, three-way level, cable release, and anything else I can fit into this small pouch. With this system I can be hands-free, yet have an entire bag of equipment on me so I�m ready for anything (and look like it). This setup came in handy when I was on assignment in Glacier National Park. There was a group of Amish women and girls who were on the edge of Lake McDonald. The coloration of the landscape was extraordinary, as it appeared to match the clothing the women were wearing. As I walked toward them, I started making photos using the 70-200mm lens. When I got close enough, I switched to my other camera that was fitted with a 24-105mm lens so I could shoot wide. These adorable girls were skipping stones and after I managed to shoot a few frames they ran off and everyone disappeared. This picture ended up running as a double page spread in the story. There is no way I would have been able to catch this moment without having my gear completely prepared and ready. Two Amish girls looking for flat stones to skip on the shore of Lake McDonald, Glacier National Park. About the author: Susan Seubert is an award-winning photographer and a guest contributor to B&H explora. B&H explora is your one-stop destination for the latest news in gear, techniques, and tips and solutions for all your creative endeavors. Find features, videos, reviews, and buying guides about the products and technologies on which you depend to make your art and edit your media. B&H explora provides the information and inspiration that will help you excel at whatever you do. This article originally appeared on B&H Photo.